The Fall season means a few things, trees start turning colors, pumpkin everything, and new fall hair trends and colors. With back to school in full swing, the weather is getting cooler, and pumpkin spice latte season is in full swing, you want to make sure your hair reflects the change in the season. What are the upcoming and hottest fall hair trends though? We looked around and found a few new trends coming up this fall season. We wanted to share some of the best upcoming fall hairstyles, colors, and trends you’ll see this fall. This fall red and baby highlights are in season! Book your appointment today ! As the season change from summer to fall, so do hair trends and styles. While summer tends to have lighter colors and bright fall has more muted tones that reflect the seasonal color change. This year more red hair tones and highlights are going to be very popular. Along with copper tones, reds, or a balayage with darker hair tones that are the trends to follow. The natural hair trend continues to evolve this fall from what we’ve seen coming out of hair salons in LA and other big cities. 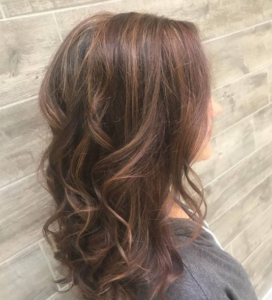 If you want to get a wonderful natural hair look (without having to grow out your hair) try an overall color and highlights that accentuate your natural color. Cooler tones with more muted highlights are going to be very in vogue this season. So if you are a more natural chestnut, trying a warm tone highlights maybe up your alley. Or if you’re a natural dishwater blonde, checking out muted darker copper maybe up your alley. Homecoming is right around the corner ladies! We always book up very quickly with homecoming updos and hair appointments, so book soon! When you need a new fall hair color change you can trust us here at Charisma Salon to make it look effortless. Book your appointment today! Fall arrived faster than anyone realized. We have been busy at work with the latest hair styles and colors for this year. Let us take the guess work out for it for you, check out these popular hair color trends for Fall and Winter 2016. Are you looking for a color idea this fall? Known as Cherry cola or Chocolate cherry, get this look with a brown base and red hues. Depending on the client’s natural hair color, our stylist will go over how to create this look with your hair. The Rose Gold color isn’t just a popular phone case cover or ring color, it has transitioned into one of the most popular hair colors this fall and we love it! Starting with blonde hair and adding pastel pink this hair color is sure to turn heads in envy. If you’re looking for this color, contact our stylists on how we can achieve it with your hair. Making a comeback for another year, White honey hair color is another color still trending this fall from last year. From different hues of blonde, silver and rose gold to exotic looks of ombre’s and balayage we are taking the traditional hair coloring up more than just a notch! Contact Charisma Salon and Day Spa to make an appointment for one of these fall and winter hair trends. Find a color trend that isn’t here? No problem, bring in a picture of the look you would like to go for and one of our professional stylists will work with you to make it happen!